Ohlone, Miwok, and Pit River men singing traditional California songs with clappers at Sogorea Te. Click here for names. Photo by Scott Braley. prayer amongst rain showers, and the spiritual encampment continues to stand firmly and in good spirits. Dozens of new visitors arrive each day, as strategy meetings and legal work hum on in the background. We are honored to announce that the 33rd annual 500 Mile American Indian Spiritual Marathon will be ending at Sogorea Te (Glen Cove) on June 23rd, 2011, after five days of running across Northern California. Runners have been asked to go in person to Sogorea Te prior to the run, to put down their prayer offerings at the sacred fire. 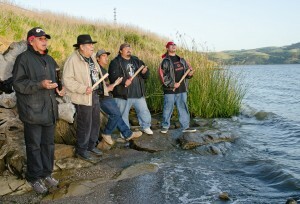 On Sunday, June 5th, the Winnemem Wintu tribe is planning to gather at Sogorea Te to dance for the Salmon. They have launched a campaign to restore endangered winter run Chinook Salmon to the McCloud River above Shasta. Just up-water from Glen Cove, thousands of threatened spring-run Chinook Salmon and thousands of imperiled Sacramento Splittail, a native minnow species, have recently died at the federal Central Valley Project (CVP) water pumps in the Sacramento-San Joaquin River Delta. Gene Doherty, President of the Solano County Native Plant Society and two other Plant Society members visited Sogorea Te this evening and received a tour of the grounds. Gene Doherty is at the forefront of a community effort to take over management of the Benicia State Recreation Area (located just adjacent to Glen Cove), since the State Parks system has announced plans to close it due to budget shortfalls. The visiting Native Plant Society members were very respectful and supportive. They agreed that there was no need for the Bay Trail to be routed through Glen Cove, and seemed to understand the importance of respecting Native peoples’ wishes regarding burial and sacred sites – Gene even asked if there were any known burial sites in the State Park that they should be sensitive to. Photos: Week 5 on the land – May 2011 – the latest batch of photos. Photos: 2005 Sacred Sites/ Shellmound Peace Walk – these photos were posted in order to illustrate the long-term continuity of the struggle to protect Sogorea Te and all sacred sites/shellmounds in the Bay Area. It was so good to see you all down there today at Sogorea Te today…miigwech for standing strong relatives. You are in our hearts and prayers. Peace be with you…looking forward to seeing you all at the Salmon Dance. Let the salmon dance again, make the rivers flow again, bless the clouds to bring us rain. wild is our spirit, migration into the vastness of the pacific, in endless rhythms across time, the river calls us home, our world is to bless the salmon, keep the land, our world can only be with a river running free, to begin again, the salmon cycles, this is the way of our soul, bless the souls of those who love and fight to protect the waters.